It’s been 10 years since we made our foray into the clinical trial arena, and what a journey it has been so far. In everyday life, monumental changes in science and technology have revolutionized how we communicate and interact with each other. This has fed into the medical imaging arena as well. The rise of the Internet, new reading methodologies, and the development of hybrid imaging, among other advances, have facilitated the digital transition of clinical trials. With this in mind, let’s look back on the steps we took to arrive where we are now and how we will continue to be pioneers in the field. First, let’s go to when the company was first born in 2001. Back in those days, imaging equipment was incompatible between vendors, the Internet network was slow and jerky, and physicians were not at ease with using computers for routine diagnosis. Moreover, there was very little collaboration between institutions. Jérôme Fortineau and I saw this gap, combined our expertise and Keosys was born. Our mission was to provide solutions to the technical limitations of that time and to develop software tools so physicians could stay focused on what they do best. After much research and development, in 2003, we launched the first electronic light box for PET/CT centralized interpretation with advanced file-sharing functionalities. This system – the Positoscope – enabled the download of PET studies that were then sent via high-speed networks to remote sites for expert advice. User-friendliness was a key feature of the prototype, a principle that has continued to play a large part in guiding our development of products and services. Most importantly, we aimed to ensure that our products were suitable for all modalities and vendors despite cross vendor compatibility challenges at that time. This allowed imaging departments to make the most of their existing and future equipment. Our continual efforts in advancing technology through research and collaborations contributed to the company shifting its focus from the clinical practice space to clinical research. In 2007, we were selected as the imaging provider in a large pivotal study of FDG-PET scan-guided therapy in Hodgkin's lymphoma (the ‘H10’ study). Our partnership with EORTC (European Organisation for Research and Treatment of Cancer), among others, established an image reading procedure that allowed blinded independent central review to take place in real time. This study was an important milestone in many respects because it was the first time that an interim PET central review was able to be used to select the appropriate patient to the treatment arm of the study. 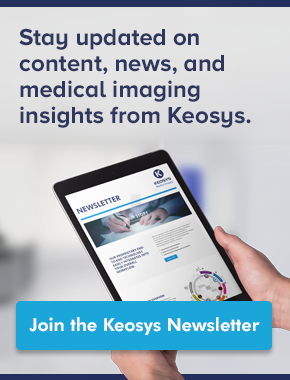 This experience solidified our presence in the clinical research space and since 2008, this is the direction in which Keosys has placed its greatest efforts as we saw how our expertise can really help trials run more efficiently and innovatively. 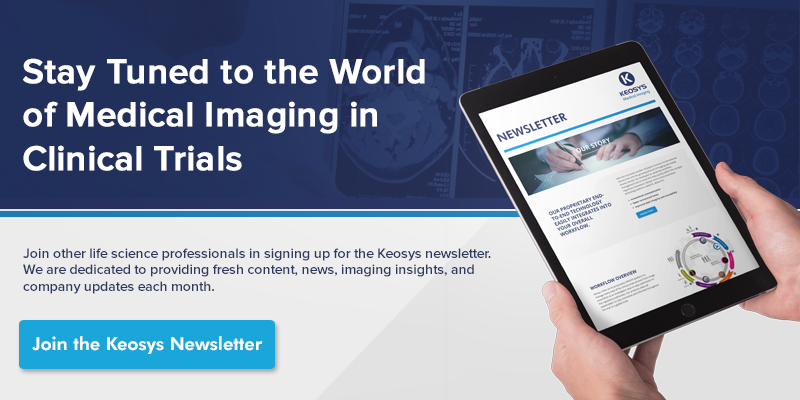 So far, our IMAGYS platform and our web-based imaging reading software are the two principal offerings. 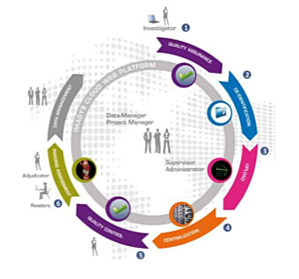 Throughout our development, we ensured that we applied a bottom-up approach in terms of our capabilities. Because we have developed all of our systems in-house, we can be highly reactive when issues crop up during a trial. Moreover, our history of working in the clinical practice arena and in academia has provided us with a rich resource in terms of expert medical teams (radiologists, nuclear medicine physicians, oncologists, hematologists, neurologists, cardiologists, rheumatologists and gastroenterologists). So far, we’ve participated in over 100 clinical trials, involving more than 2,000 investigator sites, 35,000 patients and 68 million images in multiple indications! Acknowledging the increasingly global nature of clinical trials, we set up offices in the US in 2013 and JMC Family Office, based in New York City, acquired a majority stake of the company in 2015 to continue its development. So, where do we go now? Although networking and computing technologies have become commonplace, we still address technological and communication challenges as a CRO; for example, image standardization and intercultural communication issues are continual challenges. We also strive to push the boundaries of technology, science and communication by launching new services for clients (for example, dosimetry and global site cross-calibration) and investing in research and development projects involving radiomics and theranostics to improve patient care for years to come. Above all, we strongly believe in focusing on a few things and doing them well to guarantee that we provide the best service possible to our customers. The IMAGYS platform manages every step of the clinical trials process from image acquisition at an investigator sites to data submission to the regulatory authorities in a seamless end-to-end manner. Together, our other products allow all stakeholders to stay connected and informed throughout the trial on a global scale.